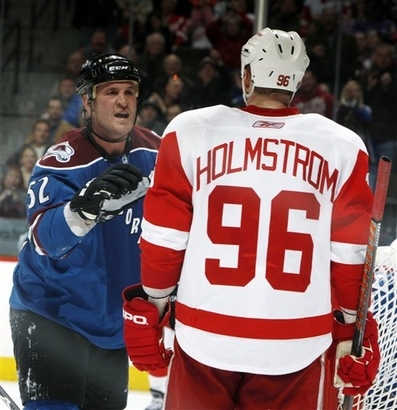 Adam Foote: Wanna fight? Homer: Nope, wanna score. Oh, THOSE Red Wings! I remember them. AND they way they played. Everyone was back. Tomas Holmstrom, Johan Franzen, EVEN Andreas Lilja. The Wings looked like … the Wings. Game #62 (20 to go, 40 points): 70 points, 8th place. The five teams behind the Wings are within 6 points; Nashville is a point ahead in 7th with a game in hand and a Friday date in Hockeytown. What I liked about the game: Don’t you just love Swedes? They scored all three Wings goals, including the Lidstrom winner. Henrik Zetterberg was on the ice for all three Wings goals; Pavel Datsyuk had two assists. Homstrom‘s line was a goal and two assists. And let’s not forget Jimmy Howard with 22 of 24 saves. What I didn’t like about the game: Who made the schedule that scheduled the Wings (and Brian Rafalski) to play the day after the Olympics ended. Thanks a lot, eh? Also, big minus-2s for Jonathan Ericsson, Darren Helm and Patrick Eaves. Also, the disallowed goal by Holmstrom. But I’m a homer. Quote I: “We’ve got enough bodies now that we should be a good hockey club. We’ve got to decide to be a good hockey club.” — Mike Babcock. What he’s saying is that the Wings have to start being the Wings again now that they’ve got all their Wings back. Got it? What is: Three quarters of the way into the season, and the Wings are back to being the Wings. Mood meter: Ready to Wing it!